New Omega Swirl Fish Oil Lemon Zest looks and tastes like a fruit smoothie, yet provides optimal levels of vital and essential Omega-3 EPA/DHA to bring you vibrant health and energy. Water, fish oil (Anchovy, Sardine and/or Mackerel), xylitol, glycerine, gum arabic, natural flavors, citric acid, xanthan gum, guar gum, antioxidant blend (Vitamin E [as d-alpha tocopherol], rosemary extract, ascorbyl palmitate), turmeric, sorbic acid. 2 tsp daily. Can be taken straight or mixed into juice, yoghurt, oatmeal, cottsge cheese or blended beverages. Refrigerate for quality. 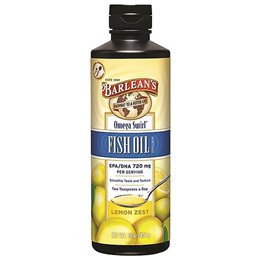 Below are reviews of Barlean`s Omega Swirl Fish Oil Lemon Zest - 454g by bodykind customers. If you have tried this product we'd love to hear what you think so please leave a review. Lovely fresh lemon taste. Easily taken - no after taste. 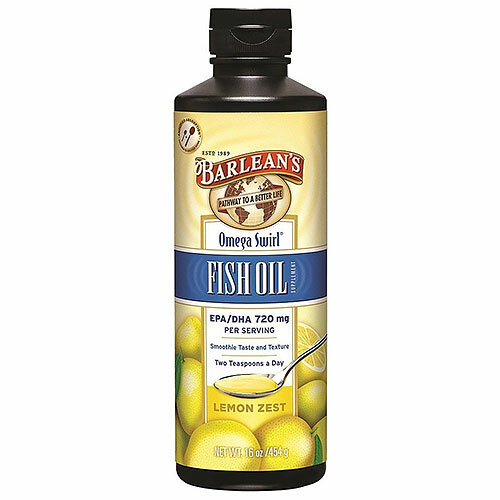 This fish oil is fantastic, no after taste, great on its own or with porridge.